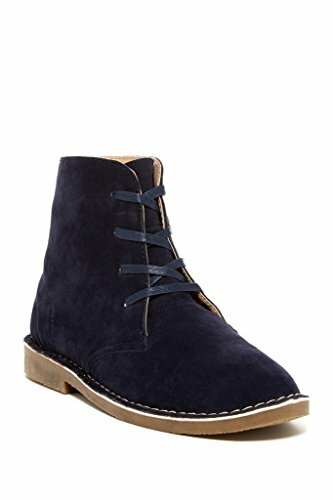 Looking for a pair of vegan suede boots that you can wear with almost anything? You're in for a treat! We've rounded up 10 pairs of vegan suede boots with options for men and women. All man-made materials and cruelty-free! 7. Men's Black Lace Up Faux Suede Manson Chukka Boots by Vance Co.
Snazzy men's navy blue faux suede ankle boot that hits just above the ankle. Laces up in the front to ensure a tight fit. Has a rubber sole for good traction. Features top-stitching with beige thread around the sole that contrasts nicely with the blue suede. Advertised as vegan: No. However, all materials listed are man-made. Pros: Quite an attractive pair of boots that won't break the bank. The high top form gives these boots a casual feel so that you can dress them down a bit, but the decadent faux suede makes them smart enough to wear in a relatively formal setting. Depending on your personal taste, you could probably get quite a bit of mileage out of them in terms of your wardrobe. Cons: May run fairly large. Women's beige thigh high boot in super soft faux suede. Matching beige lacing at the back of the thigh secures the top. Petite kitten heel and pointed toe add class and elegance. Has a partial zipper starting at the sole that will make putting the boot on easier. Advertised as vegan: No, but these boots are advertised as "faux suede." Pros: Dreamy boots to pair with a miniskirt. The low heel should help prevent teetering. Cons: Product description says "do not wash" but offers no solution for when the boots get dirty. Unfortunately, there may not be many opportunities to wear them as they're probably not suitable for the office or many leisure activities. Men's sort of casual, sort of dressy Chelsea boot in brown faux suede. Wide foot construction gives a little extra room despite the slender shape. Slip-on style with brown elastic panels on each side. Pull tab on the back helps you slip your foot inside. Has a black stacked rubber heel and almond toe. Advertised as vegan: No, but the faux suede is vegan. Pros: Everyday boots that could be worn for business or pleasure. Try them with slim trousers and suspenders for a hip look. Especially suited to wider feet. Cons: It's unclear what sort of grip these boots have for various surfaces. 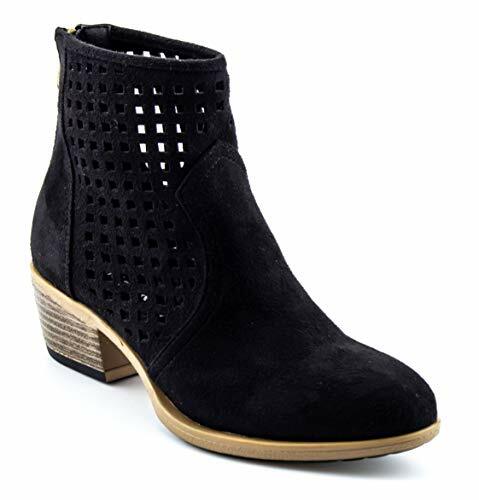 Women's black faux suede ankle bootie with an almond toe and a low, chunky heel. Features a cute cutout design on the front and sides of the boot. Zips up in the back so you can get in and out without a fight. Cushioned inside for added comfort. Non-slip sole for safe walking on moderately wet surfaces. Advertised as vegan: No. The vendor notes that the boots are vegan suede. Pros: Cutout designs are very trendy. These boots will make you feel like a fashionista. Try them with mom jeans and a crop top. Cons: It would be nice if they were water-resistant, but unless you try to wear them in cold, damp weather, it might not be too much of an issue. 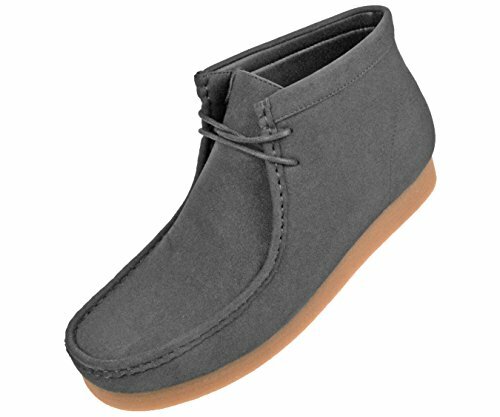 Dress-casual men's gray faux suede ankle boot that crosses moccasin and desert boot styles. Moc toe stitching gives this boot some stylish flair. Secured with a gray bootlace in the front. Has a durable, supportive rubber outsole. Advertised as vegan: No, but these are marketed as faux suede boots. Pros: Unique design that makes casual dress fun and interesting. Depending on what you wear with these boots, you may be able to pull them off on more formal occasions. Cons: Might not be too easy to clean. Probably best kept dry. 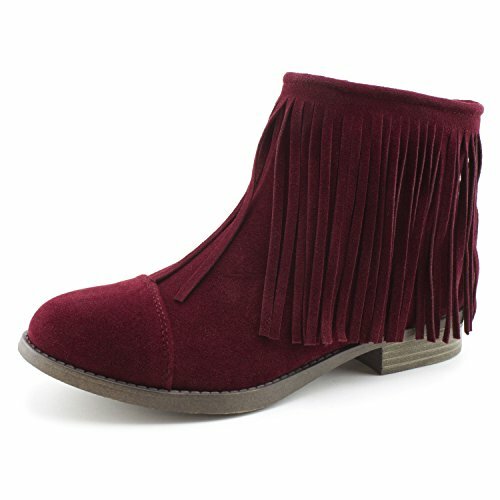 Super fringed-out women's ankle bootie in burgundy faux suede. Fringe wraps around the entire top of the boot and hangs just above the heel. Has an almond cap toe and a short stacked heel — less than 1". Zips up on the inner side of the boot. Advertised as vegan: No. The product description details faux suede and synthetic materials. Cons: Lack of insole padding, though you could buy inserts. May run a half-size to a whole size small. Men's black faux suede high-top chukka boot that rests at the ankle. Fits as snugly as you like tied with a black shoelace. Boot is unlined and has a textured outsole for moderate grip. Has a stacked synthetic heel in layered shades of brown. Advertised as vegan: No. The materials listed are man-made. Pros: Nice dress boots for someone with a minimalist style, though you don't have to wait for an occasion to wear them — they're good boots to match with chunky knit sweaters and jeans. It's also nice that they're easily wiped clean on the outside with a damp cloth. Cons: Without lining, they may not be particularly warm if you plan to wear them in cooler weather. Women's western-style short boot in beige faux suede that rises just over the ankle. Stacked block heel is 3.5" and has a wooden appearance for that western aesthetic. Fine detail stitching around the front and side of the boot. Inner side zip closure and pull tab help you get in and out of the boot in a flash. Advertised as vegan: No, but Express describes these boots as synthetic. Pros: Low-key western vibe adds just a dash of the Wild West to your wardrobe. The casual style is by no means dressed down and would look great with black, white, bold colors and neutral colors alike. Cons: No mention of lining or padding inside, so it's difficult to gauge the comfort level. Probably wearable in a variety of (dry) seasons. Casual and fashionable men's stone color faux suede work boot. Laces up to the top to fit tightly on your foot. Has a unique transparent cover over a beige cleated sole. Padded collar will protect your ankle from chafing. Advertised as vegan: No. Asos describes these boots as faux suede. Pros: Attractive work boots on the job or on the sidewalk. The clear sole protector is fresh enough to set them apart from the majority of work boots, but it doesn't jump out at you — it's subtle. Cons: It's unclear whether these boots are waterproofed. Asos recommends these boots "when the weather can't be trusted," but that's pretty vague. Women's funky beige and black faux suede bootie with a pointed toe and stunning, allover leopard print pattern. Clingy sock boot type that reaches up to the calf. 4" cylinder heel is chunky, mod and wrapped in leopard print fabric. Pull-on style with stretchy material. Advertised as vegan: No, but all materials are synthetic. Pros: Foxy boots that would look fabulous with black leggings. Look warm enough to wear in colder seasons, too. Very modestly priced. Cons: Not the pair for all-day wear or lots of physical exertion (not a dancing boot).